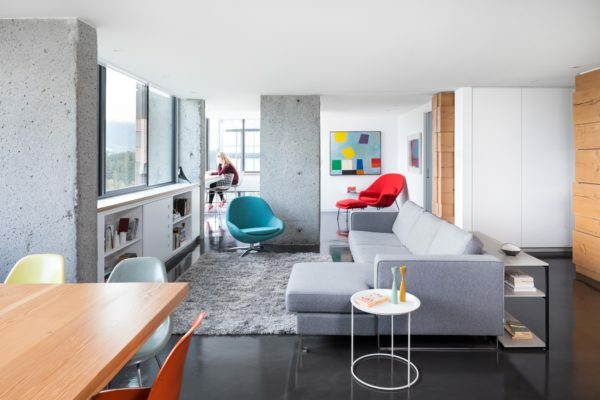 Located adjacent to Stanley Park and English Bay, the design of this 1500 SF condo unit was initiated to highlight the west view ‘corridors’ framed by the existing concrete columns. Removal of the interior walls enhance the delivery of the natural daylight into the suite creating a simple comfortable living space and serves to showcase the client’s art collection. The quiet yet rich interior was achieved by juxtaposing the vertical concrete columns, soda blasted to reveal the larger aggregate, with smooth-surfaced soft white cabinets, a dark concrete floor and painted gypsum wall board. The reclaimed wood timber stack serves to ground the ‘back’ of the living spaces and conceal a unique program requirement for a cyclist training space while also establishing a spatial delineation between public and private spaces. Hidden doors and passage ways throughout allow the suite to adapt to the family’s need for different living arrangements and feel larger with multiple circulation routes.